Once again, for the third time now, the summer tour went to the Pyrenees. 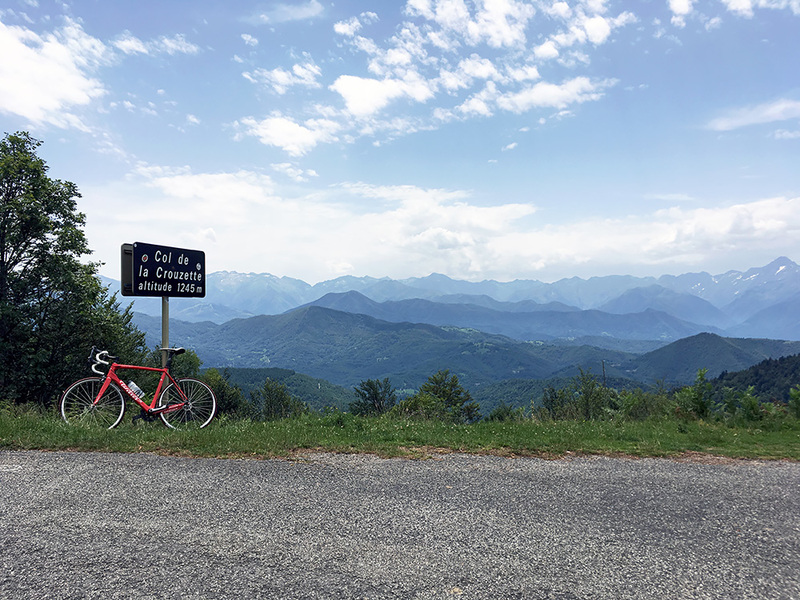 The goal this time was to finish climbing all paved passes above 1300m in all of the Pyrenees (the boundaries of which could be debated especially to the south). Also I wanted to have climbed all BIG climbs in the area that are paved (there are two unpaved BIGs). I succeeded with both, but later on discovered 2-3 more passes just above 1300m, but they are not terribly interesting, so for all purposes I completed my goal (as far as to what I knew going down there). 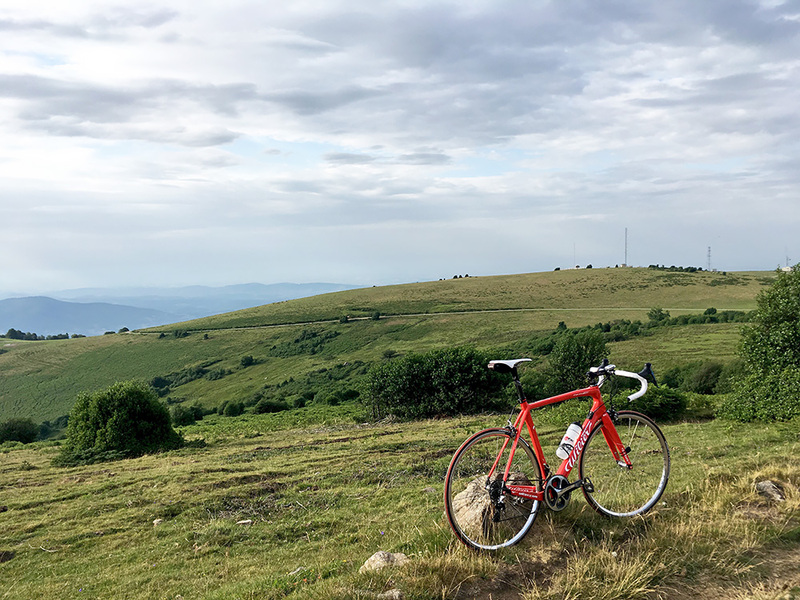 I did have put in two extra days as I know I never manage to keep to my scheduled plans, but even so I quickly had to use up them and later also skip some non-essential climbs I had included in the plan. Still I am happy with the results. A bit shorter average per day, but still a decent amount of height metres. I have to blame some bad roads, often very hot weather, break-down of the bottom brackets and a few times rainy weather. The results for the 22 days of cycling: 3301.6 km, 150.07 km/day and 72056m, 3275m/day. Map of the tour at the bottom of this page. Got off according to the plan in the morning and it was perfect weather even if a bit cloudy. There are not many kilometres to the mountains from Pointis-de-Rivière. I started climbing at Labarthe-Rivière (392m) via Lôo and Izaut-de-l’Hôtel to Aspet (465m). Met maybe two cyclists early on. 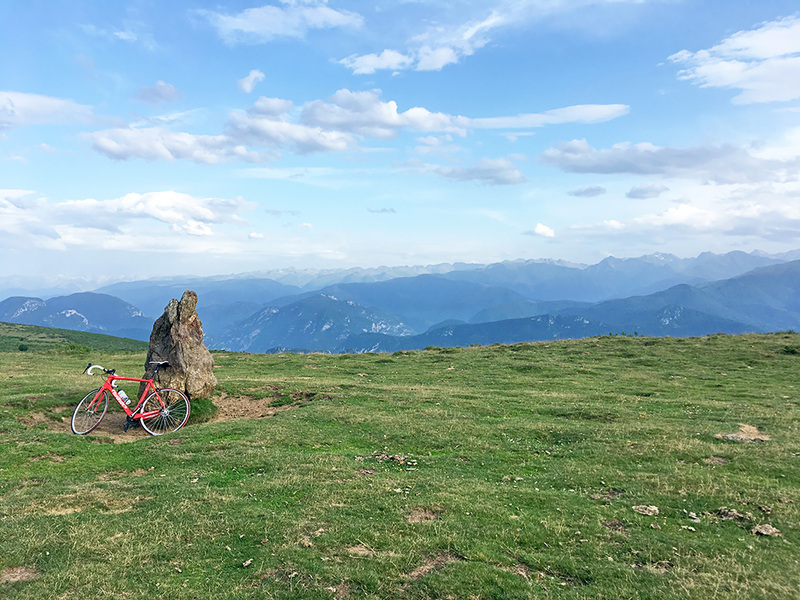 In the first photo above I am on the way up to the first real pass of this summer tour and with a typical French Pyrenees view and weather. 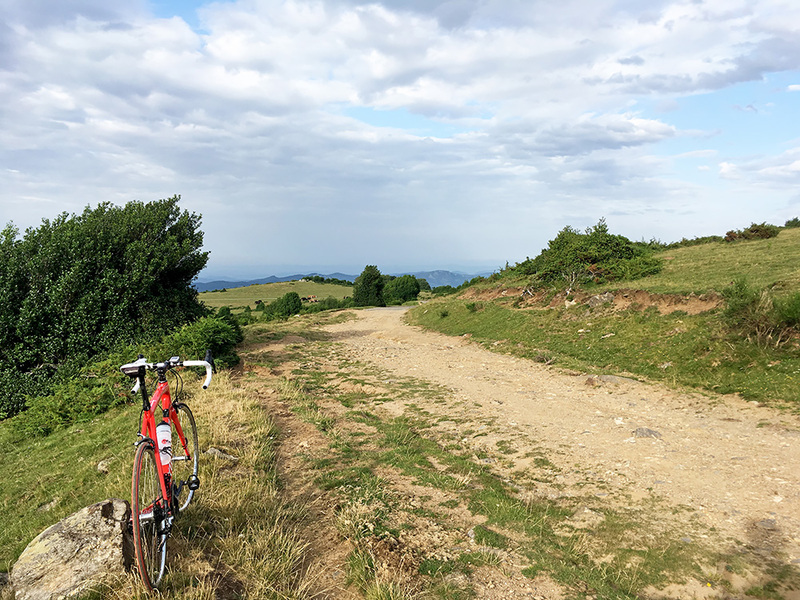 above there is the Col de Louzet (681m) and later Col de Larrieu (708m) as seen in the second photo. 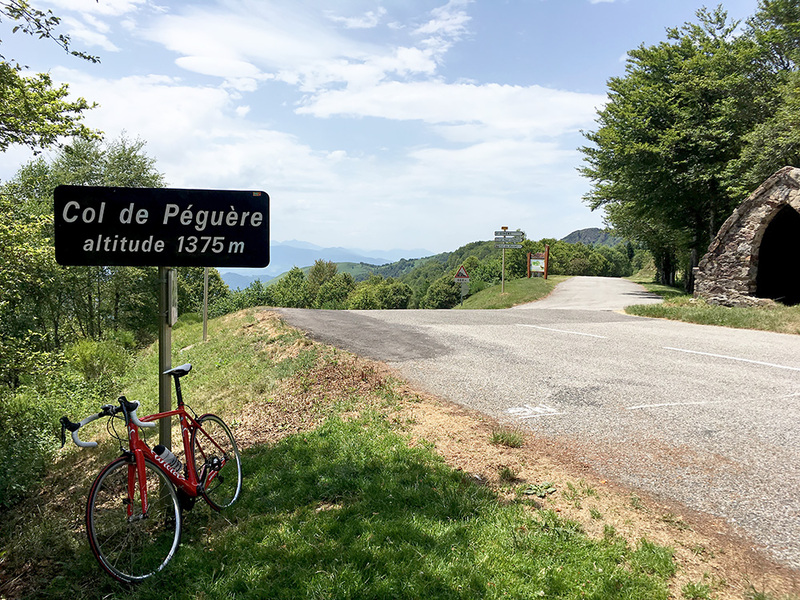 I was going eastwards in the Pyrenees now and on the east side I went down a small steep local road to Chein-Dessus (404m) and then up a slightly hard to find very local road to Col des Pérès (431m) (a very small col … ). 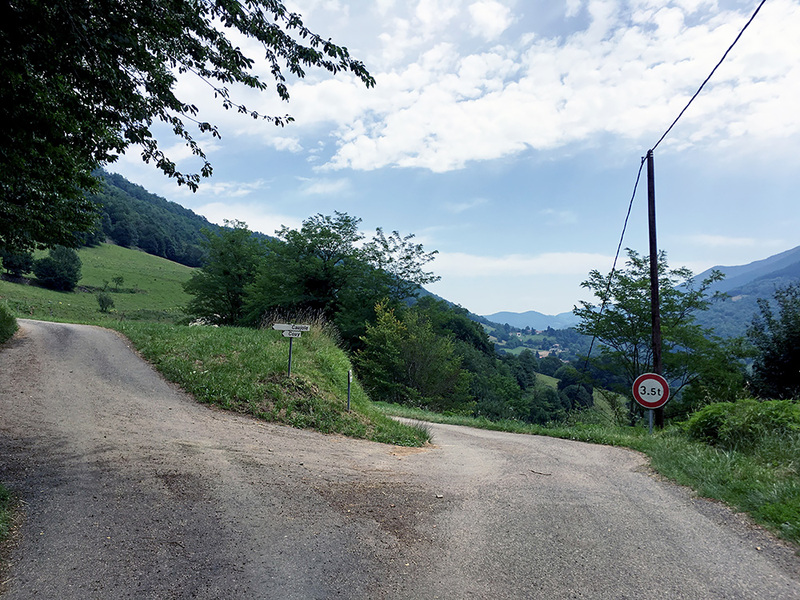 Eventually I came by Saleich (409m) and over an unnamed pass to the main road to St-Girons, but turned off this road very soon to take a minor road via Côte de Marterat (450m) with a bit washed out asphalt in some places and very narrow, but nice alternative to the main road. My first stop was by a grocery store just at the entrance of St-Girons (392m) where I had a coca-cola. Now it started to get more hot outside, but I was on my way to higher altitudes also. 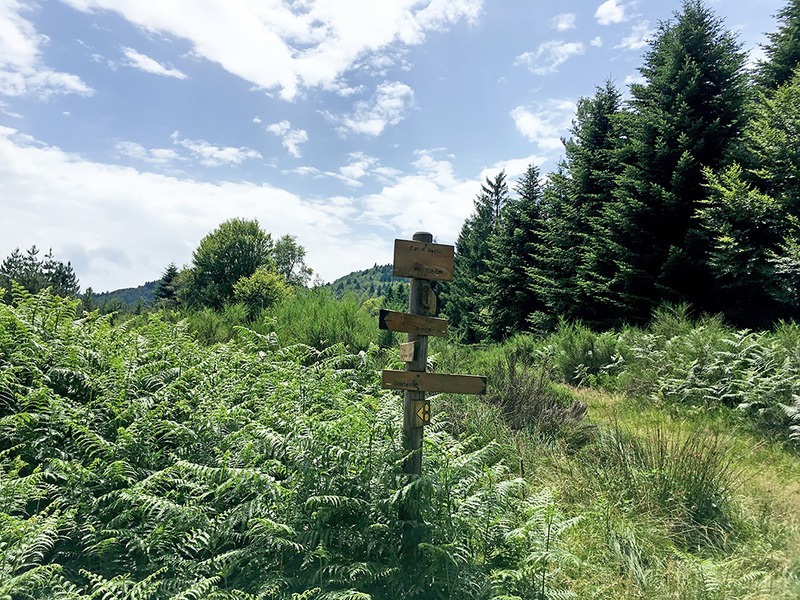 I continued up the valley on the east side of the Le Salat river and found the small road to Le Coch sign-posted D603 Encourtiech. This is a fun serpentine road to a slightly dubious col (Le Coch (531m)), but a nice and not fast short-cut over to the road up to the more imposing passes on my way. There are several different ways back down the valley. In the above photo one has to take the lower road and then I went down the first steep road from this. The photo here I was simply stopping in the slowly raising valley by a nice house with a well-kept garden in the otherwise slightly lonely valley (most houses are up the mountainsides). 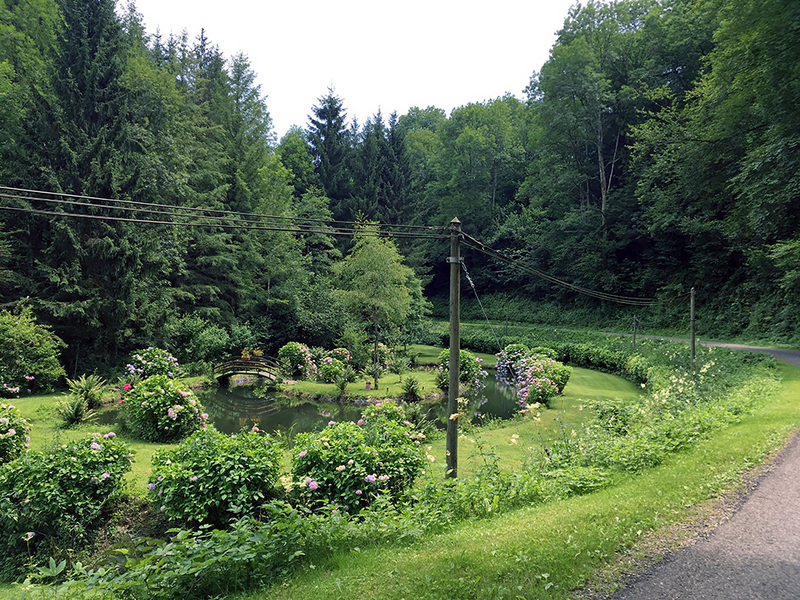 Rivèrenert is the only village, but there is no shop or bar anywhere in this valley. Soon here the climbing starts up to Col de la Tournerie (898m), but the road just continues up until a crossroad. At the crossroad (994m) I went down a bit to collect another pass, namely the Col de Rille (942m), which would have been more expedient for cyclists if it had been placed up at the crossroads. Same way back after the photo of the pass sign. Said hello to some American(?) cyclists debating on which way to go at the crossroad. Then continued on the nice road to Col de la Crouzette (1244m). Up at Col de la Crouzette the road goes down to Biert, but this is also the start of the nice ridge road going to Foix (with many optional road choices along the way). So for the second time I followed this road from here to the east. Up here I really got a sense of being up in the high mountains again. 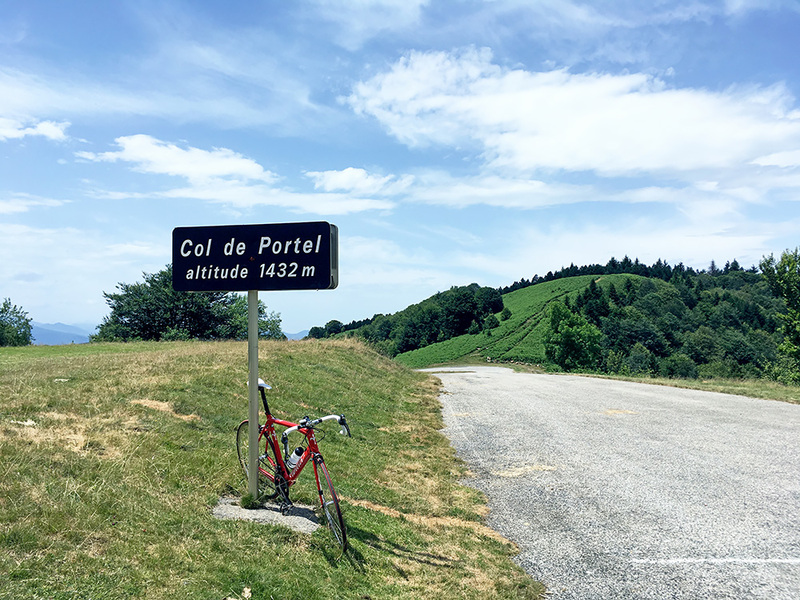 Next pass is the Col de Pradel (1291m), but the road after a little dip continues up to the highest point, the Col de Portel (1435m) with good views down north. From thre it is finally downhill to Col de Péguère/Pas des Massadels (1375m), the most famous pass along the road despite not being the high point, but that is because the road coming up from Massat here to the north is unusually steep up here (the road that disappears down behind the sign in the photo here). From Col des Caugnous (947m) on the main road from Massat to Col de Port (1249m) the road that turn off up here is 12.2% on average for 3.53 km, which is similar to some of the steeper climbs in the Alps (though they are often longer). I continued down toward Foix, but just after Col de Jouels (1247m), I had decided to take the forest road via Col d’Uscla (1258m) (sign in the photo here, cannot be read in the small size here). This road is really a forestry road and I only met one person sometime soon after the pass working in the woods. It is a bit rough road and not a fast one, but it is also interesting and nice in some spots along the way. It is however a very long road and no one to see and no buildings at all along the way. 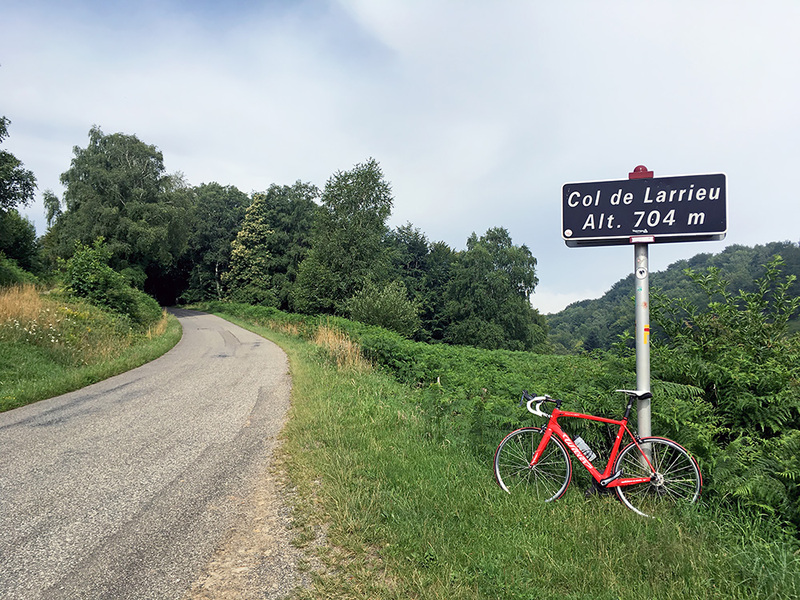 After quite some time I got down to Col de Légrillou (938m) where one enters back into civilisation again. From here it was a faster descent with some road choices down to Foix. I continued down to the city to have something to drink before the next climb. 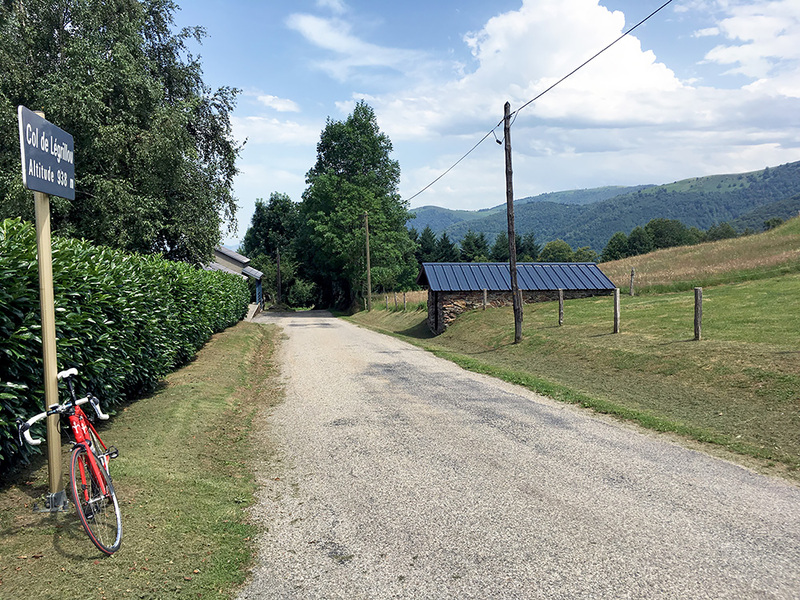 Had a Belgian Leffe, but it was not enough so went over to a grocery to buy a coca-cola, water and sun cream, that I had thought to stop earlier to buy and was now getting rather red in the hot sunny weather I had on the long ride from St-Girons (where I should have got it). 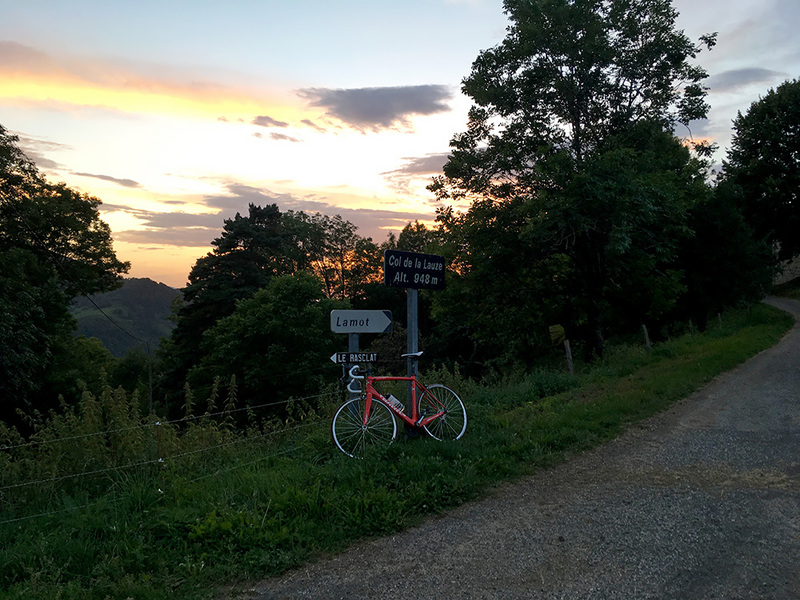 After quite some time I was finally on my way again and returned up the same way I came into Foix, but now took off on the first road above to climb up to Prat d’Albis (1422m) (a BIG climb). This was hard in the hot weather, but kept pushing on until I got up. At the end of the asphalt road the gravel road soon reaches an unnamed pass (1450m) (suggested as ‘Col de Touron’ on OSM maps by someone, which makes sense as the mountain making it a pass is the Mont de Touron). It is only 665m to the pass height and it is mostly possible to cycle on the road there even with a road bike and you get much better views north as you see here (looking northeast here). Looking here a bit more just straight east (could not just choose one of them and a panorama photo might have been better, but they are of less good quality when using an iPhone and manually merging them seldom works well). Back to the asphalt road. Hade thought a little about crossing over here as there should be a road that is mostly asphalted coming up to the eastern side of the Touron mountain that I had planned to climb properly from the other side later. However, did not want to take chances now as it was getting a bit late. But two more photos from the asphalt end of the road first. Here you see the start of the gravel road that ends just 50m ahead here. Much better view up at the pass! 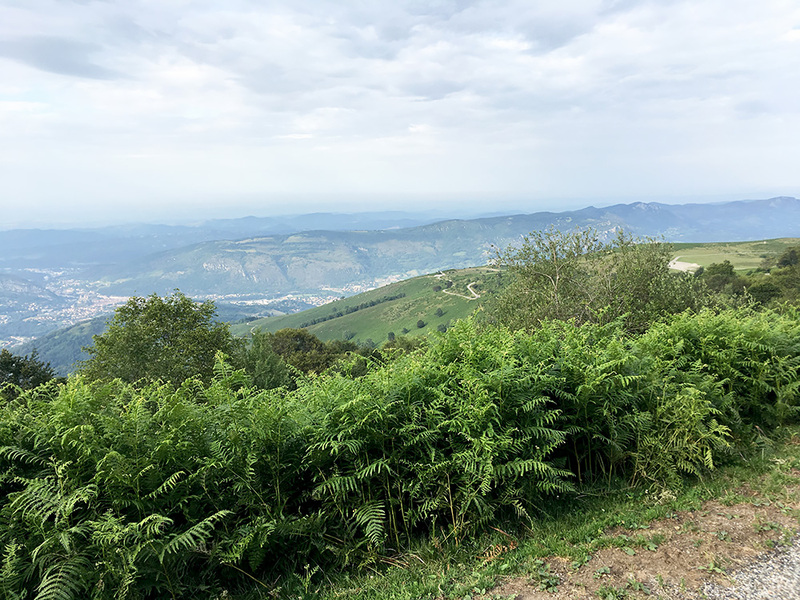 Stopped at one place for a view of the Foix from the road. This is a fairly nice climb. Met one cyclist going up on the way down who might have waited until after work to go up, which was also wise given the heat earlier. 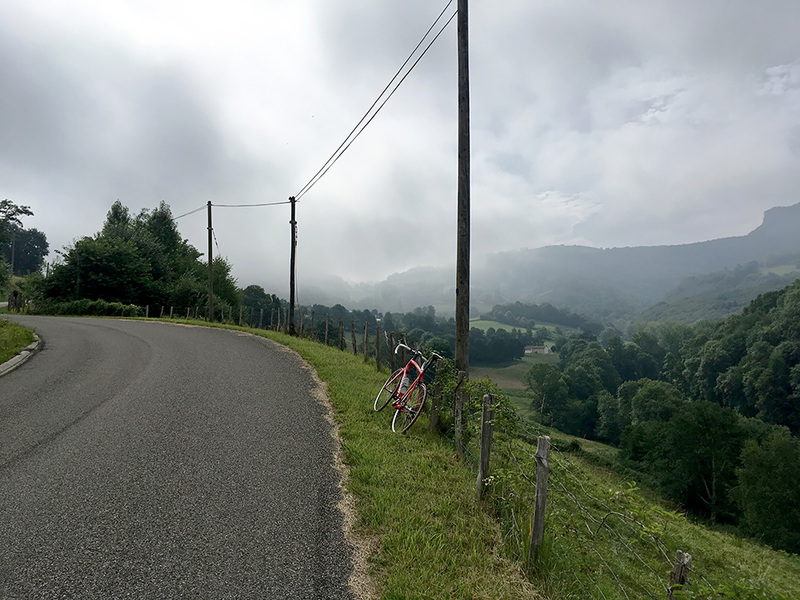 I decided I did not want stay in Foix as I wanted to make as much of the planned day ride as possible, but was behind schedule a little and it was now getting late. 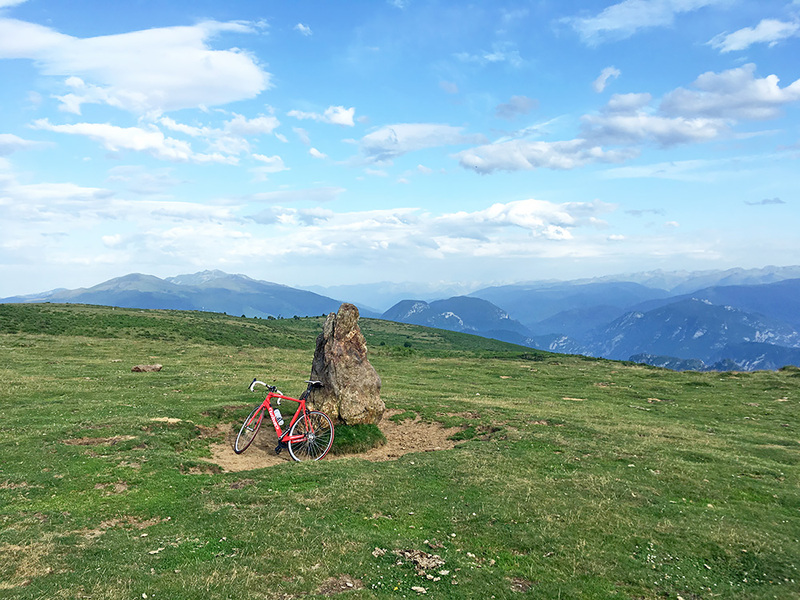 I decided to stay at the first best place after Foix, but there were no obvious good-looking place one the way north from Foix (383m). I followed my planned road and turned off east at Saint-Antoine. Then decided to try and find a place at the next Saint-Paul-de-Jarrat village, but there was nothing there (a closed chambre d’hôte maybe). Reluctantly I continued to Celles. In Celles there were nothing either and no signs ahead suggesting anything either. Anyway I continued on the nice little road up to an unnamed pass at Freychenet (803m). There was nothing there either. I continued and saw one place, but it was apparently just a restaurant (or farm selling something). 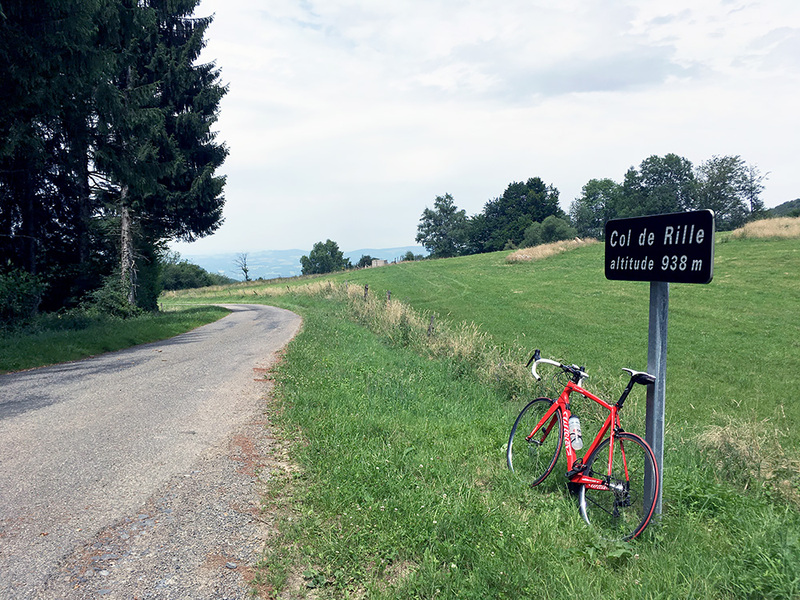 After continuing on I came to the Col de la Lauze (948m) where I had seen some somewhat expensive place to stay at when researching beforehand, but did not see it now, so went down via Col du Four (884m) to Montferrier (826m) where I had originally planned to stop and tried to find the two places I saw on Google maps, but they both seemed closed (could not locate one of them). Saw some people out on a parking ground and asked them if they know where to stay and soon enough they called a place just a bit outside the village at Martinat (there had been a sign for this place, but hard to see the text in the twilight on the way down). I was given a ride up there by the nice people in Montferrier. It was a nice place run by a retired Parisian and his wife. He had some relatives back from my hometown in Sweden. They got me some nice and simple things to eat despite the late hour and we talked a lot before going to bed. A really good ending of the first day on the tour and maybe the only day I managed to do all things planned (not easy if every day should have been just like this rather long day).